The versatility of dental implants allows them to correct a wide range of tooth loss circumstances, whether you’re struggling with one gap or several. Better yet, instead of having to restore each implant with a customized dental crown, a fixed bridge or partial can accommodate several implants at once, creating a reliable and cost-effective addition to your confident smile. At Roselle Park Dental & Implants, we look forward to helping you create the ideal treatment plan for your unique goals and budget. Contact us today to schedule a first appointment with Dr. Oshidar and the rest of our experienced staff! What is a Fixed Bridge/Partial? 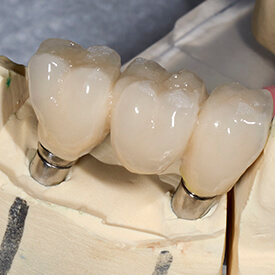 An implant-supported fixed bridge/partial is designed to attach over multiple placed implants, providing excellent function, comfortable, and aesthetic quality. They will also stay permanently in place (just like real teeth) with no removal necessary. Patients should become used to their new tooth replacement in just a short time, and they’ll experience a significant improvement in their ability to chew and speak. Traditional bridges are also a potential option for tooth replacement. Instead of implants, this custom-made prosthetic receives its support from adjacent teeth, as dental crowns are placed as “anchors” over these teeth to hold the new bridge permanently in place. However, the natural teeth will need to be significantly altered for this procedure, which is why our team is more likely to recommend the implant-retained option. What is a Removable Bridge/Partial? While a fixed bridge can provide reliable permanence, some patients prefer the convenient, removable nature of their traditional denture. In this case, Dr. Oshidar can provide the best of both worlds in the form of a removable implant-supported partial denture. These appliances attach just as sturdily in place over anchored implants as their counterparts, but they can be successfully removed by the patient when desired for cleaning, storage, and more.